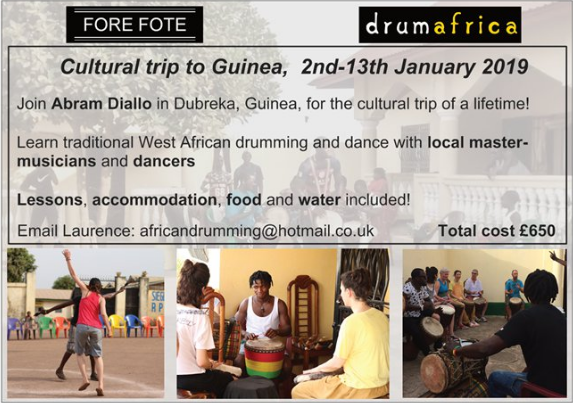 Join Drum Africa and Fore Fote on the trip of a lifetime! 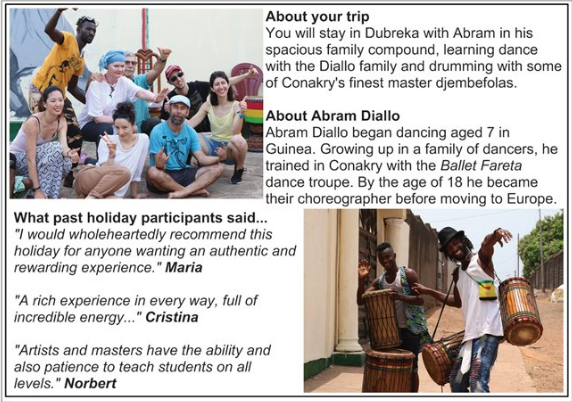 This will be an experience like no other: living among the locals in Guinea, West Africa, in the safe company of Abram Diallo in his house in Dubreka. 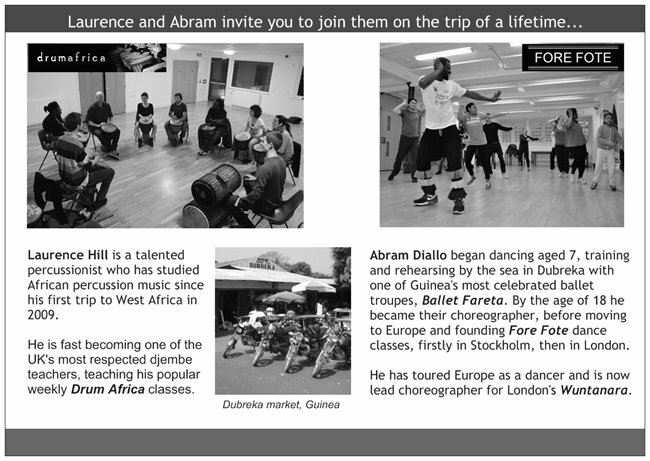 See our flyer and information below, and email africandrumming@hotmail.co.uk if you wish to find out more. £650 for 10 days is a real bargain price so don’t miss out! The deadline to pay your 50% deposit is 1st December 2018. 2nd January: Fly to Conakry airport in Guinea via Casablanca (you book your own flights) This the recommended route from UK to Guinea. Optional visit to Bel Air, Guinea’s most beautiful and relaxing beach-side village. Lessons will be in French, with translations and extra help provided by Abram. All accommodation and in-house food and water is provided during your stay. We advise you purchase a filter water bottle to bring with you as an extra precaution! You will have to pay for transport during your stay, but ‘neuf-place’ taxis are very cheap! Don’t forget to make sure you get your travel vaccinations, anti-malarial tablets, mosquito nets and water-filter bottles ready before you travel! You’ll have a great time and learn more than you thought possible!